where fell in love with the Blues. He listened to Gospel and Country Music on local radio stations. 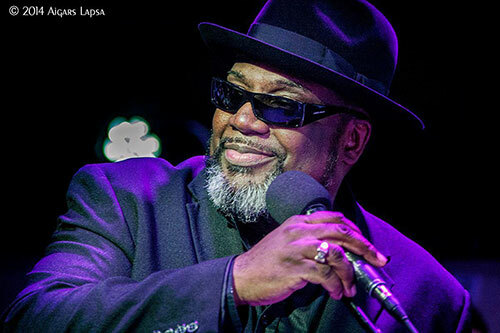 “I didn’t know what the Blues was before!” This quickly led to his stage career, jamming all over Germany singing the Blues and making a huge impression with his warm and soulful voice. Yet again after wielding my Media Pass I squeezed through packed fans on Sunday, 29th August, to film alongside the accommodating Scene One Lighting & Sound Team for a clear view of the stage. So worthwhile for this feature length Jazz&Jazz YouTube. Norman, Ginny and I rushed from one venue to another to film each and every band/group for YouTubes -about 60 MP4 films in all. We missed out just one or two because we had filmed them previous Fest Jazz years such as Ben Waters. And on another because we spent a long time at/filming the Tuba Machine event in Scene 2. Would have missed more had it not been for Ginny’s careful scheduling – she was a slave driver!